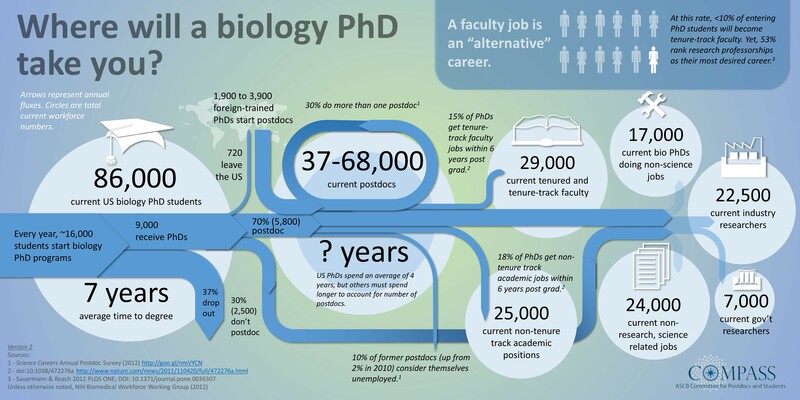 Where do PhDs and Postdocs Go? For potential graduate students and postdoctoral researchers to make informed decisions about their science and their careers, they need to have all the facts at their disposal. One metric that is needed is data on the career outcomes of previous graduate students and postdoctoral researchers at programs and institutions. There have been calls for decades for this data to be made available, but while data on undergraduate, law school and medical school alumnae have been available for some time at many institutions, the research enterprise has dragged its feet in getting such metrics available for academe. However, there seems to be a turning point under way, in the gathering pace of those looking to share outcomes. Rescuing Biomedical Research recently convened a consortium of stakeholders to discuss Improving transparency in Ph.D. Career Outcomes. While the discussion has focused mainly on graduate students, groups such as the Coalition for Next Generation Life Science are also committed to releasing postdoc data, and released the first set on July 1st 2018. While this all has a very biomedical flavor to it, there is hope that these principles are easily applied to all fields. For some institutions, length of postdoc and career outcomes. Some interesting aspects of this data are discussed in this blog post. The resources below are an effort to combine all of this information together, along with resources on the discussion about career outcomes data. Below you will find resources listed by institution – if your institution isn’t there and you know of data, please contact info@futureofresearch.org to let us know, and we’ll gladly add the information in here. Groups that have been working on this issue include the Association of American Universities (AAU), the Association of American Medical Colleges (AAMC), the Graduate Career Consortium (GCC), the Coalition for Next Generation Life Science, the NIH Broadening Experiences in Scientific Training (BEST) Consortium, the Council of Graduate Schools (CGS) and Rescuing Biomedical Research (RBR). Joshua Hall at UNC Chapel Hill is also keeping a list of programs dropping the requirement for the Graduate Research exam or GRE – you can see that list here. *Section 403C of the NIH Health Reform Act of 2006 (P.L.109-482) requires that institutions receiving NIH-funded training grants report these statistics to their graduate program applicants. Please email info@futureofresearch.org if an institution you are contacting is not co-operative. This list is not exhaustive and will be updated as we receive information – please contact info@futureofresearch.org with any updates or comments. Schools vary by data presented/standard of data presentation. Note some schools report across all fields, whereas some only report for biomedical fields. PhD Graduate Career Outcomes: Data. 10,000 PhDs project, on PhD alumni from 2000-2015: Data. Biological and Biomedical Sciences (PhD): Data. CNGLS Feb 1 data: PhD Admissions, Completion, Time to degree, demographics: Cornell University Graduate School. CNGLS Feb 1 data: PhD Admissions, Completion, Time to degree, demographics: Data. Graduate School of Biomedical Sciences (PhD): Data. The Graduate School Career Outcomes (PhD): Data. Sackler School of Graduate Biomedical Sciences (PhD): Data. Graduate Program Statistics (PhD): Data. Paper on Postdoc Career Outcomes in PLoS Biology. The Coalition for Next Generation Life Sciences website is here. We issued a statement on the Next Generation Life Sciences Coalition here and we will issue regular updates as data is released by the coalition. Their paper on the rationale behind the coalition, “A new data effort to inform career choices in biomedicine” was published in Science in December 2017. The effort spearheaded by Rescuing Biomedical Research, “Improving transparency in Ph.D. career outcomes” describes outcomes of a meeting of stakeholders, examples of the kind of data that individual institutions could collect, and how aggregate data could be presented. There is also a thorough discussion of taxonomies to be used in presenting career outcomes information. A paper, “Visualizing detailed postdoctoral employment trends using a new career outcome taxonomy” has been published in Nature Biotechnology, describing standard taxonomy and visualization methods to provide postdocs with tools to critically evaluate career prospects. The Council of Graduate Schools issued a statement on career outcomes reporting and has also issued a report, “Articulating Learning Outcomes in Doctoral Education“. Johns Hopkins recently released a report on the biomedical enterprise which among other issues lays out the context for the desire to increase transparency in academia. The Association of American Universities Data Exchange may be a place to watch for possible data updates. A wealth of data on a survey of the membership: Data. A report of data across a number of European countries: Data. Which grass is greener? Personal stories from PhDs about their careers within and outside of academia: Paper.